I took Friday off work and spent a long weekend on the sunrise side of Michigan. Six of us from the office gathered at the retreat house we’ve been to several times before and while I never seem to get quite enough sleep at these things, it was a fun weekend. Four of the ladies went up on Thursday; I was the last to arrive on Friday afternoon. 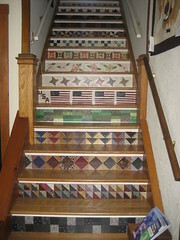 New this time were the decorated stair risers; at first I thought the owners had found a variety of quilt-themed wallpaper, but it turns out they used real fabric arranged into different quilt block designs then put some sort of lacquer on top to seal them. This is the kind of house that would drive a minimalist crazy, with everything from mismatched Fiestaware on open shelves in the kitchen to fringe on many of the lampshades and of course quilts, quilts, and more quilts in a riot of colors and patterns hanging on walls and thrown on couches and stacked on shelves and draped over tables and layered on beds. It’s a feast for the eyes, that’s for sure. I spent most of my sewing time working on the baby quilt I’d started at last fall’s retreat. (Yes, the baby it was meant for is getting quite old by now.) I barely worked on it at all in the intervening months, as I wasn’t convinced the colors and pattern were working. I sketched out a block arrangement months ago before I put the project into storage and fortunately was able to a) find and b) decipher it even though I hadn’t written good notes about what the symbols I’d used represented. By late Friday night, I finished the remaining blocks I needed to complete the top, but slept on it before I started sewing them together just in case the wine and late hour made the layout look better than it really was. Happily, I still liked it on Saturday morning, so was able to complete the top. I’d share it, except the person I plan to give it to might see this, so instead I’ll show you the top made by the friend who sat next to me made over the weekend. 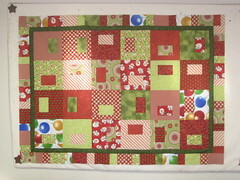 The outer border on it was a happy accident, made from extra pieces she had cut due to the directions for the pattern being unclear. As at past retreats, we took turns with meal prep. I was responsible for Saturday dinner, and it ended up being done rather later than I’d hoped. I swear the lasagna needed twice as long in the oven as it should have; whether that was because another dish was cooking on the rack below at the same time or I messed up the temperature accidently when adjusting the timer or both or something else, I’m not sure. Fortunately we had lots of snacks and wine to tide us over and no one starved while waiting for me to get dinner on the table. I joked that I was just trying to get us ready for the fall back time change and dinner was not really an hour late. On the way home Sunday I stopped to walk along the beach and take some pictures, so I was standing in the wind looked at the water when one of the ladies called to say they’d hit a deer not very far out of town and they were okay but the vehicle was not. Since both I and the other lady who’d driven up by herself were both nearby, we met at the accident site and were able to get all the stuff (and for a quilting retreat, there’s a lot of that) into our cars with room left for everyone to have a place to sit on the drive home. Not a great end to the weekend but of course it could have been worse (even for the deer, who at least died a quick death).